The bad weather yesterday came in early with high winds and more rain. 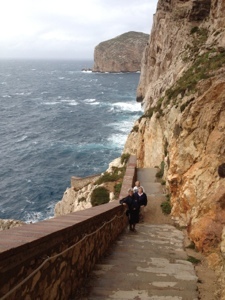 We decided to visit Neptune’s Grotto – a cave of stalactites and stalagmites on Capo Caccia about 15 miles from Alghero. The entrance is at sea level but you have to climb down (and back up) 650 plus steps. As the buses now only run twice a day in the off season and the boats weren’t going out because of the rough weather, we went by taxi. Giuseppe, our driver, gave us a guided tour of the area before dropping us at the top of the staircase and waiting for us. They were about to close the grotto due to the high seas starting to flood the cave but they allowed us in as a special concession. It was spectacular! The photos will not do it justice. 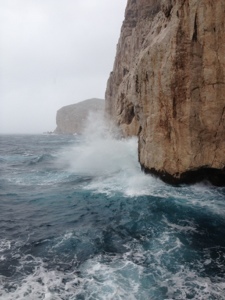 When we came out, the seas were building and looked very impressive – especially when you’re not on them! We got back to the boat about 2.30pm for lunch and to watch the DVD, The Best Exotic Marigold Hotel, in the warm and dry as the winds from the Sirocco gusted up to 52 knots. Last week the fridge stopped working and we thought it was through a lack of gas, which proved to be true. Liz had tightened one of the couplings already before our local fridge repairman arrived at 4pm to regas it and agreed to come back next week to check whether there has been any further leakage. As we have had to be careful with food as we haven’t had a fridge for a week, we decided to go out to a local pizzeria in the evening. Pictures below of the staircase down to Neptune’s Grotto, inside the cave and the entrance itself. This entry was posted in Equipment, News and tagged 2012, Equipment, Italy, Maintenance, Med, Sardinia. Bookmark the permalink.